Time flies when you're having fun. And these past few days flew like a hurricane! Surely it would have been a lot different had it not been for the new friends we have made in our 3 months' stay here in Wellington. 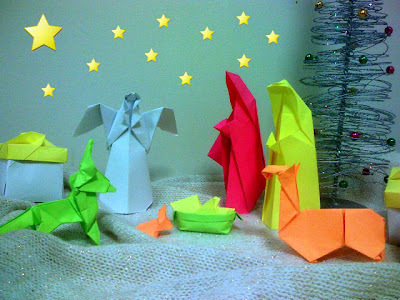 Rather than staying cooped up in our apartment and thinking of what we ought to be doing at this time of the year back in the Philippines, our friends kept us occupied. 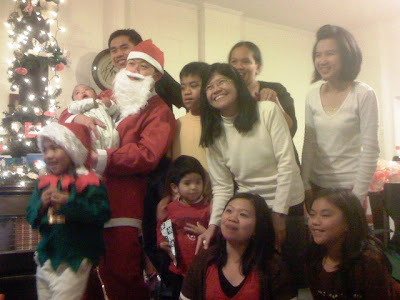 We would all go to the shopping centres (not that we have the budget to shop, but it's great to buy our necessities at discounted rates), they would tour us around, and more importantly, they invited us to their homes and shared their blessings for the yuletide season. 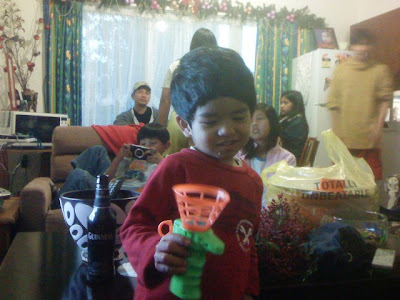 Last Noche Buena, we stayed at Glen and Cory's home. We arrived in mid-afternoon and we were glad we did, because we were able to help out a bit with the preparations. I most especially enjoyed preparing the maki, which Glen instructed me how to make first before entrusting me with the batch as he proceeded with the barbecue. Some friends and family members arrived as well. 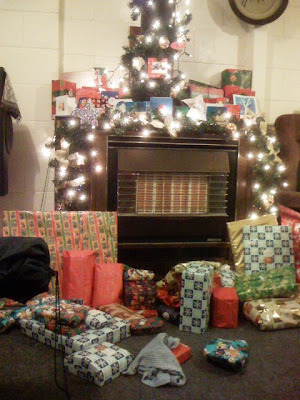 We had a very hearty dinner, followed by a rather fun way of distributing gifts. They actually had a Santa and a Santa's helper costume for the gift hosts for the night! That was fun. We were delighted that we also received gifts! It was so thoughtful of them and we appreciate it. Round 2 of the gift exchange was a game called the Greedy Man's Gift Exchange. It was a lot of fun. I will discuss the mechanics of that one in a future post. 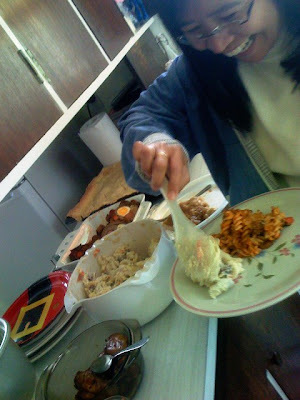 We stayed on til Noche Buena, where we had the bounty from the barbie (nickname for barbecue grill), pavlova, salads, and loads more. Any attempt at dieting was promptly forgotten. The kids were still wide awake at 2AM trying to decipher a board puzzle they received as a gift when we left for home. 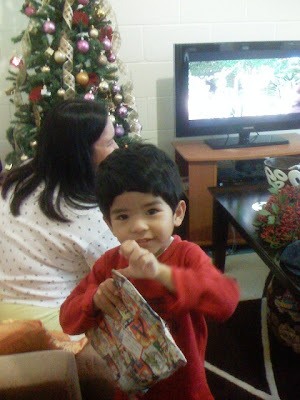 On Christmas Day, we were invited to dinner at Ricky's and Pinkee's home. Myra and Jerry and family were also there. We had a wonderful dinner and exchange of gifts. The laughter and chatter continued well into the midnight. 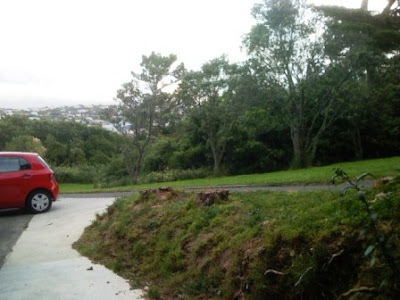 I feel so blessed that we have met a lot of good friends here in Wellington. We actually have other invitations that we were no longer able to go to; we regret not being able to visit but we will, one of these days. 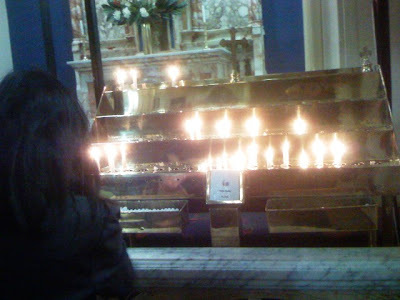 We were overwhelmed by the kindness and generosity shown to us. I wish that everyone will be blessed with good health and prosperity in the coming year, and that we will also be given the opportunity to pay it forward soon. This is one December I will never forget. Boxing Day is celebrated the day after Christmas, and is observed in the United Kingdom, Australia, Canada, New Zealand, hongKong, and countries in the Commonwealth of Nations. It was originally a day of gift giving, whereby the wealthy / landowners gives gifts to their tenants and servants. Today, Boxing Day has evolved in New Zealand to an after-Christmas shopping day, with many shops offering a lot of products on sale. And since most offices are closed, it is also a time for families and friends to get together. We received a call from Glen this morning inviting us to join their family today for shopping and taking a ride out to one of the parks. We happily accepted and soon we were off to Kilbirnie for some shopping. A lot of people were up and about, taking advantage of the specially-discounted prices. 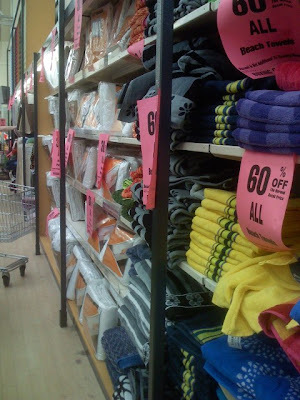 Many items were marked 20-60% off! There was a call for New Zealanders to spend in order to cushion the effect of recession and with the crowded shopping centers and parking lots, I believe they stepped up to the call. 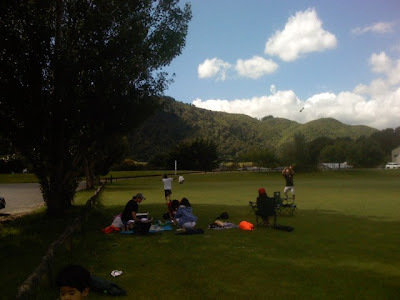 After a couple of hours, we went off to a park in Upper Hutt for picnic. 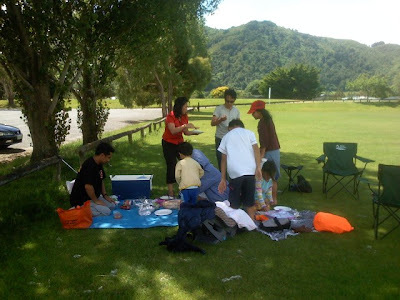 Others were spending the day in the area as well: joggers with their dogs, bikers, a family having a picnic by the river. 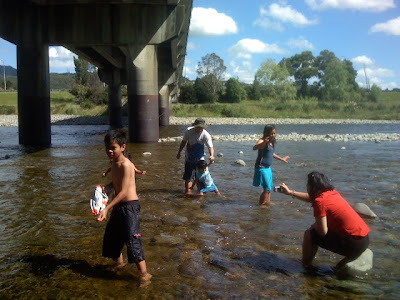 We also spent some time wading in the river. The kids loved it! As for me, I found the water a bit cold, but Jo-Lo enjoyed every bit. Other families were also in the area; a father and son tandem paddled slowly by in their kayaks. We had a fun time. Thanks Glen, Cory and family! The Te Papa Museum in the Wellington CBD has a unique and amazing display that's truly a treat for the holidays. Nope, it's not Santa on a sleigh. It's something more. Lots more. 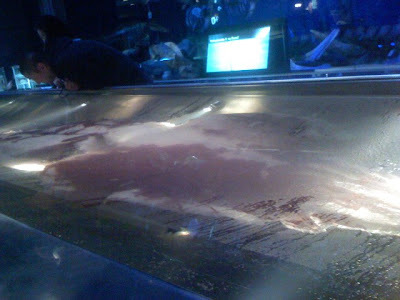 It's a colossal squid! Its the only squid display of its kind on the planet (next to Atlantis'). The squid is currently enclosed in suspended animation in a hug tank with liquid that keeps it preserved. Reminds me of Han Solo enclosed in carbonite. 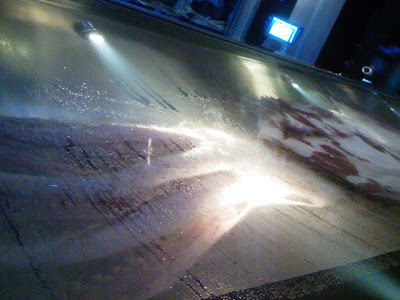 The giant squid was caught in Antarctica as a fish it was feeding on was caught by a commercial fishing vessel. The squid was still alive when it was reeled but being pulled out of its high-pressure habitat meant the squid will die soon. The squid was then brought on board and measures taken to preserve it on its journey to the laboratory. 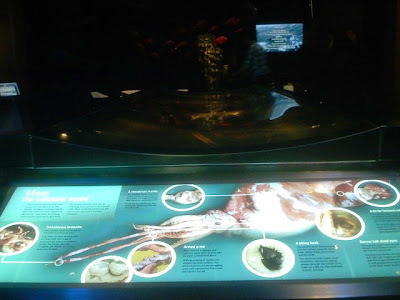 The display at the Te Papa highlights important structures of the squid and its functions. 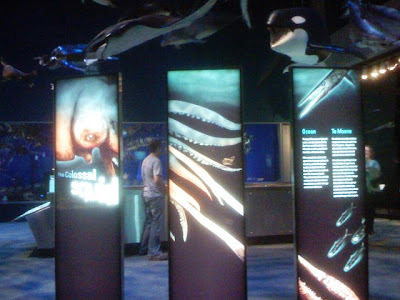 Engaging displays and video make the exhibit truly exciting. 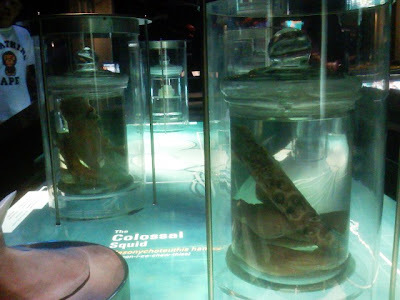 For more information on the Colossal Squid display, visit the Te Papa website. It features a documentary on the squid discovery, loads of information, and even squid games! 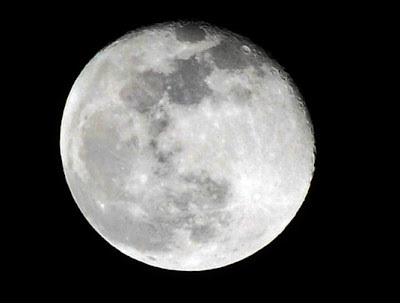 But a good friend shared his photos in our mailing list and I was amazed by the detail he was able to capture of the lunar surface using a Nikon D90 with 18-200 VR lens. I asked permission to post it here. 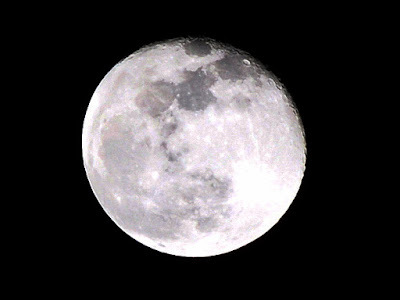 The moon was no longer at its fullest but it's still an aswesome sight. Enjoy! Photos courtesy of John Paras. Check out his photography work at zenfolio. New country, new people, a fresh start. It can be a very exciting time especially in the first month when the trip feels like an adventure and discovering fellow Filipinos, making friends, and going to the usual tourist haunts make it truly look like a holiday. But as the days roll into a month, you will realize just how different New Zealand is from your home country. Well, for one thing, there is a lot of good things I see here. Fresh air, greenery, great people. But since you will be joining the workforce soon, you are still unsure of how you will fit in. Well, here's a truly simple yet beneficial idea: volunteer! Volunteering has its inherent advantages: you can try new skills (or stick with what you know), get to interact with the local people, and start contributing to the development of the community! The variety of things you can do is limited only by your sense of adventure. There are other roles waiting to be filled as well. You can become a host at a Community Center, help with food preparation in a kitchen, plant trees in the countryside, write newsletters and articles for a community site, teach English, care for animals, do gardening and lots more. Plus, the registration procedure is 100% painless! :-) Excited to volunteer? 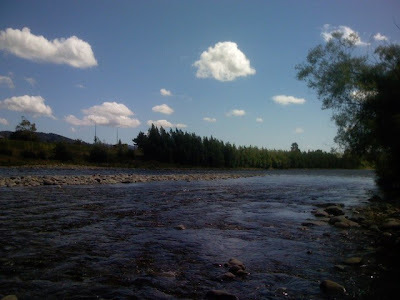 Volunteering New Zealand is where I was able to get my volunteer role. Head on to their website and click on "volunteering opportunities" to get a list of roles available. Then, you can register online as I did but the next day I also decided to go directly to their office instead. It's very near the Civic Center (where the Library is located). In fact, I would encourage you to visit their office but call first so you can set an appointment. The people in the office are very helpful and accommodating. Many of them are volunteers too! The process is really simple. You need to fill-up a form, after which the coordinator will interview you to gauge the amount of time you have for volunteer efforts and your interest. Then, you will be shown some open roles. It will be great if you check the website and identify roles you want so you can share this immediately. You may only have an hour or so with the coordinator, so if you can save on the time searching for roles you like, they can help further by making introductory calls to the organisations you have identified and then they will pass the call to you to introduce yourself and say that you are interested in volunteering for them. A schedule will likely be made for you to meet them for interview. You will then be given a print-out of the list of jobs you have identified so you can personally follow-up. Note that in some jobs, there may be specific skills that they would like you to possess already so don't lose heart if you are not selected for the role. It's just that most likely they organisation is also being run by volunteers and part time workers and that they do not have a structure for training people. Just move on and contact the other roles in your list. I was walking in Johnsonville Mall one day when i stopped in my tracks. R2D2! Right in front of a store chock full of Lego boxes! 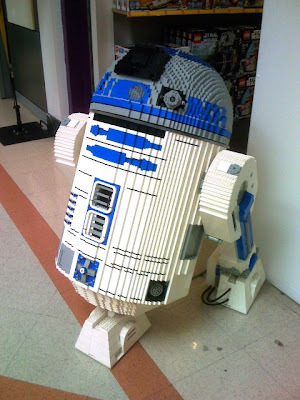 The astromech driod was waist-high and is itself made of Lego. But its dome would occasionally swivel, lights would blink, and beeps and whistles would elicit awe. They had lots of Star Wars Lego items on sale. Tempting! 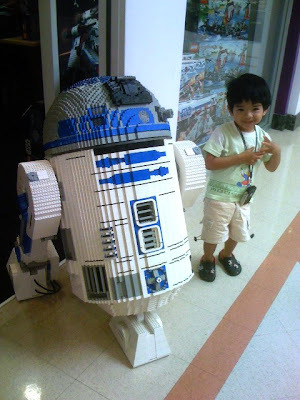 It reminded me of the R2D2s I left in Baguio. They're all packed away, waiting for the day to be displayed on a display cabinet once more. 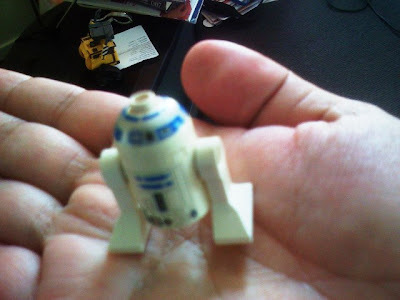 I still have a small memento though... this Lego R2 unit went aboard the plane with us. 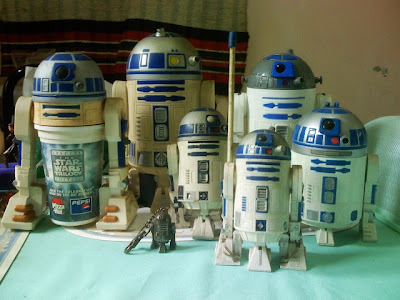 Here's to having more astromech droids in my collection! One of my simple pleasures. 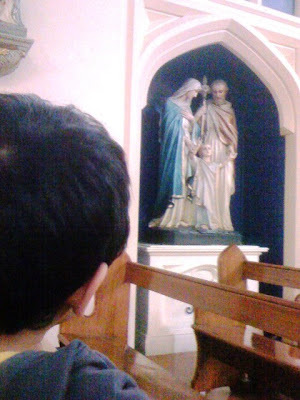 Yesterday, December 8, is commemorated by the Catholic faithful as the feast of Mary's Immaculate Conception. 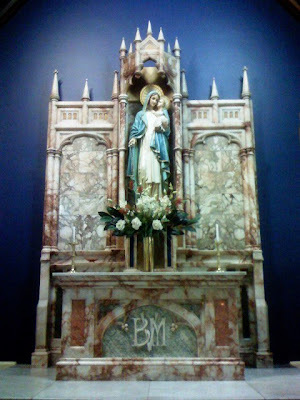 We dropped by the St Mary of the Angels in Wellington to say our prayers. 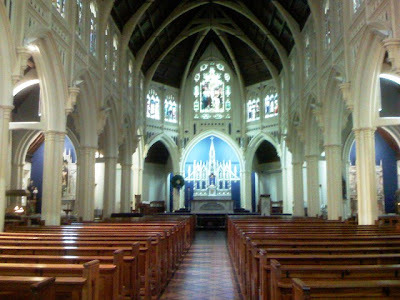 St Mary's is located along Boulcott Street in the busy commercial center of Wellington. It's a magnificent place. 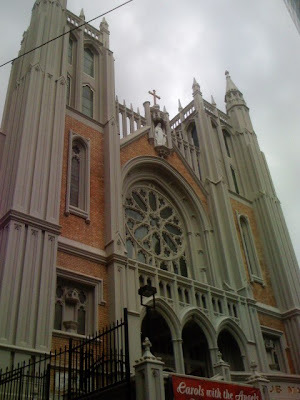 I am sure Filipinos congregate here on weekends to celebrate the mass. 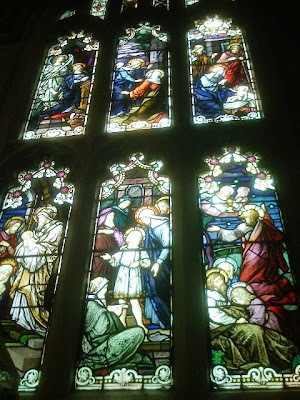 St Mary's has an expansive display of stained glass windows. The faces are intricately drawn. 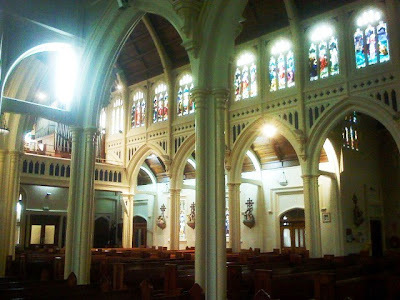 It reminded me of the stained glass windows of the Baguio Cathedral. 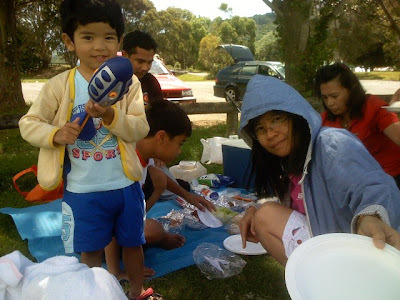 Summer is finally here in New Zealand. Yup, you heard it right. December is the official start of summer, and this sunny season will last til February next year. When we arrived here, winter had just ended but the spring air still had that cold bite, and we would usually go out with jackets, bonnets and scarves. It has become considerably warmer though, and there were a few times when the duvet made it a bit too warm at night. We now also find some afternoons too warm for sweaters and jackets. That said, the weather is still relatively unpredictable. You can have an overcast sky in the morning with some showers, and then it will be a sun-shiny day by lunchtime. See the photos below? They were taken only a couple of minutes ago. It is now 8:30PM. Amazing, huh? At least, for us from the vicinity of the equator. This sunny disposition has actually left our body clocks a bit confused. A couple of times I was in the city and I thought there was still a lot of the afternoon left. I would realize it was already 7 only when I would looked at my watch and beat a hasty retreat to the bus stop. We would also sleep at around midnight and wake up quite late in the morning already. Whew! Santa also gets a costume change in this part of the world. Instead of being all wrapped up in red, he's in shorts and with a surfboard by the beach! One of the interesting things I learned about Wellington is that there is always a sizeable amount of information that can be had on paper for free. 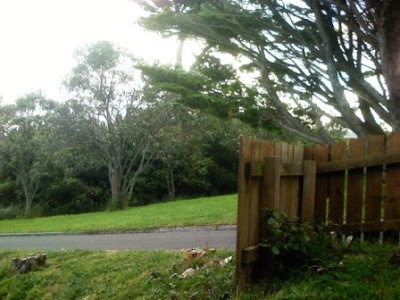 Before, we had a "no junk mail" sign posted on our mailbox. But being relatively new to the place, we are curious to know what type of junk mail one can receive. And so we removed the tag preventing us from getting these. A lot of the unsolicited mail are catalogs on sale days and deals you can get from department stores. That one's no surprise. 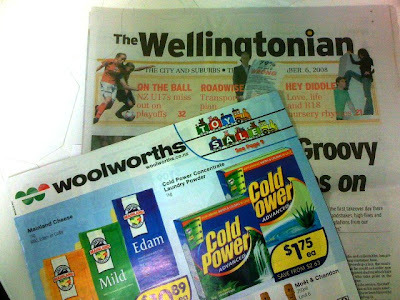 But interestingly, we also get free newspapers such as the Wellingtonian which features local stories and ads. I borrowed an arts and crafts book from the library to try out papier mache and origami from paper headed for the kiwi bin. If you want to learn about apartments and rooms for rent, try visiting your local supermarket. They usually have a notice board where you can post your advertisements for free. They even provide you with the paper to write on. You can find room or house vacancies, babysitters, garden trimmers, Spanish lessons, guitar and violin lessons, and even garage sales in these boards. 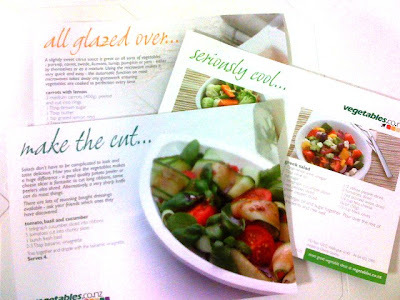 These supermarkets also carry recipes bound together like pad paper. 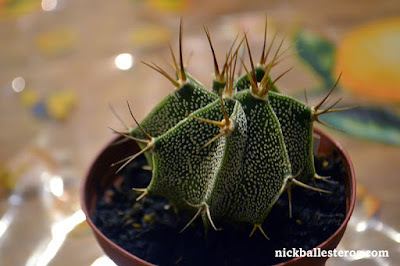 Simply tear off a copy of the ones you are interested in. 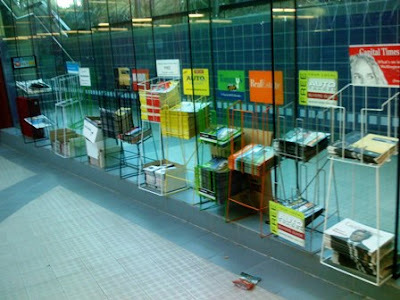 And also in selected areas such as the Library and in the Central Train Station at Wellington, there are a number of brochures and free newspapers you can get. The catalogs often feature used cars and houses for sale; these can give you a general idea of the going rate for cars and house in the current market. 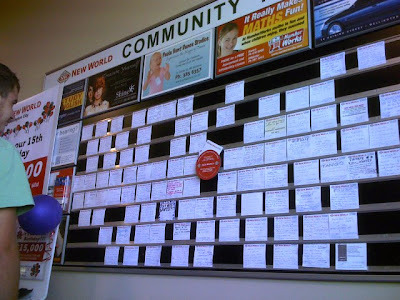 I think the bulletin board is a great idea for a small town atmosphere, such as Baguio City. People can trade more openly and it fosters a feeling of community spirit. PS It's December 1st... Happy Birthday Leo! 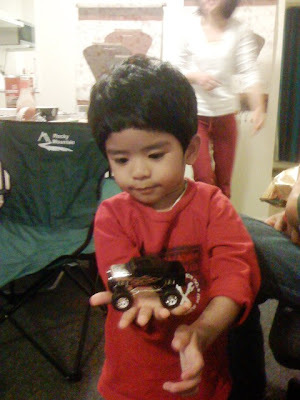 Belated Happy Birthday Sonny and Jhunix!